My kids are getting older but our house is not getting any bigger, so last year we reluctantly said goodbye to our collection of LeapFrog Tag readers. Thanks in part to all the hours they spent with their Tag readers, my kids are already good readers, so our Tags and Tag books have found a good home with their younger cousins. Learn to read with the #1 selling reading system! The amazing touch technology of Tag brings books to life to teach phonics, vocabulary, comprehension skills and more. And a library of 40+ interactive storybooks, maps and more feature characters to help inspire children to learn to read. I've praised the Tag so much in the past that I'm in danger of sounding like a TV informercial, so I'll just point you to some of my past Tag posts so you can read all about it. I have to say, though, Leapfrog has made so many improvements to the Tag, I hardly recognize it! The latest Tag is smaller and sleeker, so little hands can hold it better. We received a standard green colored Tag, but it now comes in many other colors: pink, purple, purple-and-green, orange, teal, even a Toy Story branded Tag. Leapfrog expanded the Tag's memory from 16MB to 32MB a couple of years ago, so you can keep 10 books stored in the Tag at any one time. When I first blogged about the Tag in 2008, MSRP was around $50, and three years later, it still the same price. But I haven't blogged about the Solar System Adventure pack yet, so I can rave about it all I want. It's really a nifty little reference book -- or should I say map, because although it's about the same size as a regular Tag book, it actually unfolds to a long-narrow, 2-sided map of the solar system, full of information and facts about the planets, asteroids and more. It works just like a regular Tag book -- touch on an image, say, of Saturn, and you'll hear all kinds of fun facts about the planet (it has at least 64 moons!). All the information is up to date, including Pluto's reclassification as a dwarf planet, along with Ceres, Haumea, MakeMake and Eris. I had no idea those other dwarf planets even existed, so I'm learning right along with my kids. 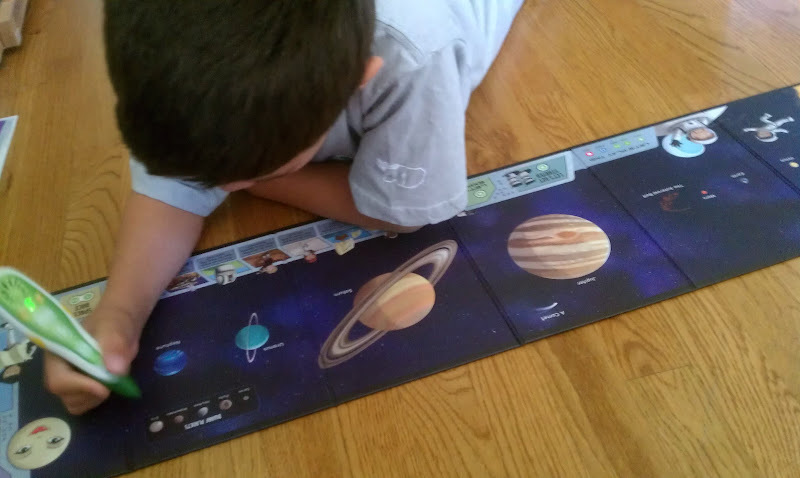 In addition to all the facts, the Solar System Adventure pack has activities, games and quizzes. Kids can test their knowledge of solar system facts, listen to clues to find the mystery spot, or play a board game by themselves or with a friend. It even comes with several sticker pages -- and get this, the stickers work with the Tag reader too! We're really enjoying the Solar System Adventure pack. The age range says 4-8 years, but this is something kids of any age can look at, again and again. My 10 year old likes it, and so do I! Honestly, nothing! They've thought of everything, down to the velcro-sealed box where you can store the game board, stickers, passport and instructions, all in one place. With the Solar System Adventure Pack, Leapfrog has extended the life of the Tag Reader to beyond the 4-7 age range. It's a reading tool, game board, activity pack and reference book, so everyone in the family will love it! One lucky Bonggamom Finds reader will win a Leapfrog Tag and Solar System Adventure pack -- just in time for the holidays! Leave a comment on this post and tell me who which member in your family would enjoy the Solar System Adventure pack the most, and why. This entry must be completed before any extra entries will count. 3) Leave a comment on my Solar System Adventure Pack video on YouTube (1 entry). 6) Enter my LeapPad Explorer giveaway (1 entry). 7) Enter my Leapfrog Story Time Pad giveaway (coming soon! -- 1 entry). 8) Enter my Leapfrog Peek-a-Shoe Octopus giveaway (coming soon! -- 1 entry). This giveaway ends at 11:59PM PST on November 27, 2011; I will draw 1 winner at random on November 28 and post the winner's name after he/she confirms acceptance. Continental US residents only. For additional giveaway rules, click here. Good luck! I have a nephew who would LOVE it! My son would enjoy this, we like to star gaze!! I think my son would love this. He is really interested in the stars and planets. My 7 year oldson would love this. He LOVES anything space related. Thansk! My grandson would enjoy it most because he loves educational, interactive toys! Middle Grand-Daughter would like this. She is at an age where she is learning to read and explore--I gave them a subscription to National Geographic and they love to "read" about nature. My 4 year old would love it most. My other child would be too young for it. Left a comment on you tube. Entered the leappad explorer giveaway. My son would love it! He's into Solar Systems & Constallations right now~like big time! & he's struggling in reading at the moment. It would be perfect! I entered the Leap Pad Explorer giveaway. My 10 year old daughter would really love this tag system! She is a learning-aholic! I've entered the LeapPad Explorer giveaway. My 5 year old son would love this, and he's learning about planets right now in school. My 4 year old son would enjoy this TAG book about the solar system becasue he is just getting excited about books and the planets. This would be for my son who LOVES to stare at the sky just to see what he can see. My 7 year old would love this. She loves to learn about space. My son would play with this the most as he loves playing games. My 5 year old son would enjoy this the most because he is learning how to read and he loves the solar system! GrandDaughter would love this because she loves to learn about everything. My daughter. She is very much into stories and interactive play. MY son would love this, he is fascinated by the solar system. I would give it to my brother's twin daughters! my little boy - ready to learn to read -- kinder next year -- perfect! My son would love this, he's fascinated with the moon, stars, etc. think my one grand daughter would really enjoy this. She loves papa to talk about the stars to her. My daughter would love this. She is really into planets. my son loves learning about space! wrote on you FB Page Lisa W.
My 4 year old son would love this - he LOVES everything to do with space nad planets. My daughter would love it because she is n ow in prek and is learning to read.